Inadvertantly, of course. Authorities in Milas, near Bodrum, Turkey (once known as Halicarnassus of Caria), spent 7 months investigating a gang of looters, eventually following them to an illegal dig. The area was large so it wasn’t until after police arrested the looters that they found out the wretches had made an enormous find: the 4th century B.C. 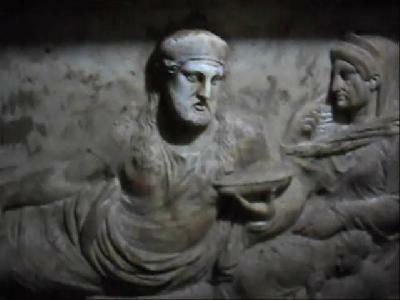 tomb of King Hekataios of Caria, father of King Mausolos of Caria. It was for King Mausolos that a tomb was built which was so large and lavish that it would become known as one of the Seven Wonders of the Ancient World. In fact, it was so wondrous that they named that whole category of grandiose tombs after Mausolos. His father King Hekataois, also known as Hekatomnus, was a satrap of the Persian empire, but his success on the battlefield carved out an autonomous kindgom in Caria, a kingdom ruled by his descendants for 50 years, until Alexander swept through on his way to conquering the world. So far what’s been found is a large tombstone that dates to 390 B.C., but who knows what else is on the site. There is some damage on the stone already, some caused by humans trying to dig it up in God knows what atrocious way, some by time. “The tomb stone could be as precious as Great Alexander’s, which is exhibited at the Istanbul Archeology Museum,” said [Undersecretariat of Culture and Tourism Ministry Özgür] Özarslan, adding that the relic first had to be saved. “The Ministry of Culture and Tourism will deal with that issue,” he said. “The tomb stone has a length of 2.75 meters and a width of 1.85 meters,” said Culture and Tourism Ministry Properties and Museums Managing Director Murat Süslü.